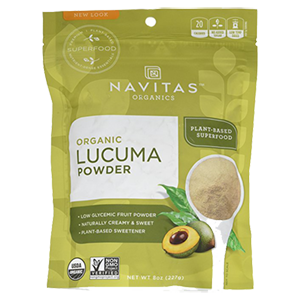 Lucuma powder is a natural whole fruit-based sweetener from South America and is indigenous to the Andes regions of Peru, Chile and Ecuador. 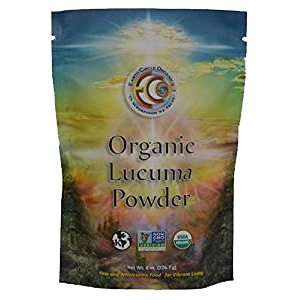 Although used extensively in these cultures for centuries, lucuma has only recently in the last few decades become available to other parts of the world, mainly as an alternative sugar substitute. Sold as a powder made from the dried, subtropical, starchy yellow-orange fruit, it is known to offer a sweet taste but without a concentrated amount of sugar content. Providing a healthier choice for those wanting to decrease their daily sugar intake, it is a whole food option to consider over condensed and evaporated sweeteners. Believed to be lower on the glycemic index, it is often recommended to type 2 diabetics and those wanting to reduce calorie consumption. 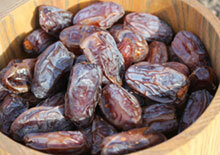 Because it quickly starts to ferment soon after ripening, it is hard to find fresh outside of its local habitats. 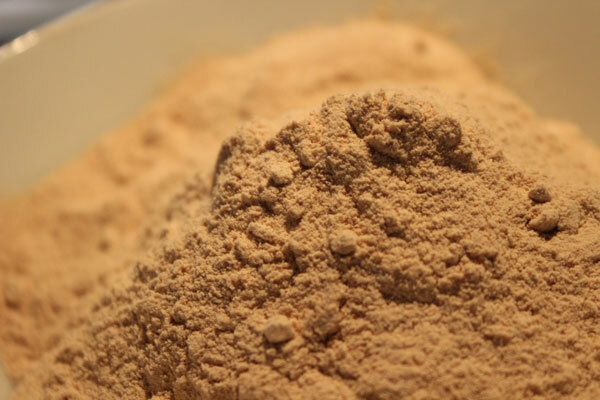 It can sometimes be found as a frozen pulp or fruit concentrate in Latin food markets, but is mostly sold internationally as a milled, fine silky powder that is slightly lighter in color compared to the ripe fruit. Prized by ancient civilizations of Peru, lucuma is often called the "gold of the Incas." In the 1987 publication "Fruits of Warm Climates" it was stated that "Archaeologists have found it frequently depicted on ceramics at burial sites of the indigenous people of coastal Peru." (Source) It was also an often used symbol of creation and fertility in the art of the Moche and Nazca peoples. Today it is a popular fruit ingredient served on festive occasions in South America, especially where fresh lucuma is obtainable. 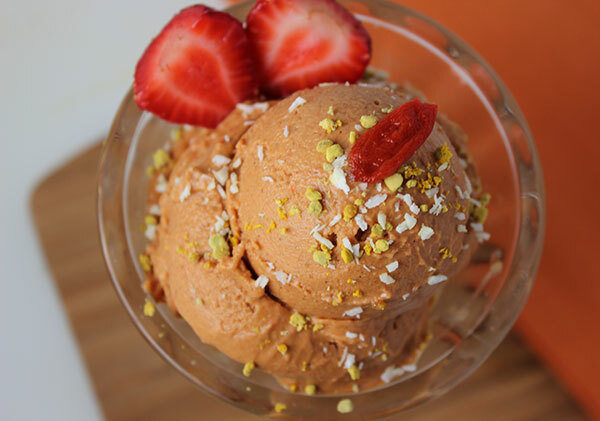 It is also a cherished favorite Peruvian ice cream flavor and used in various traditional Chilean desserts, like lucuma meringue cake or "torta de merengue lucuma." Lucuma is often described as having a taste combination reminiscent of maple syrup, caramel and sweet potato, however in its dried form it smells and tastes somewhat like a blend of ripe apricots and dried goji berry. While the fruit can be eaten fresh, it is typically blended into foods, drinks and desserts due to its dry texture and unusual powdery mouth feel that is not as appealing as juicy sweet fruits normally consumed. 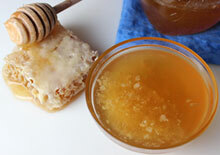 Because of this feature it is frequently used as a natural sweetener. 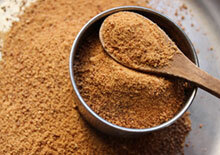 It is not, however, utilized in quite the same way as granulated sugars, like coconut sugar. 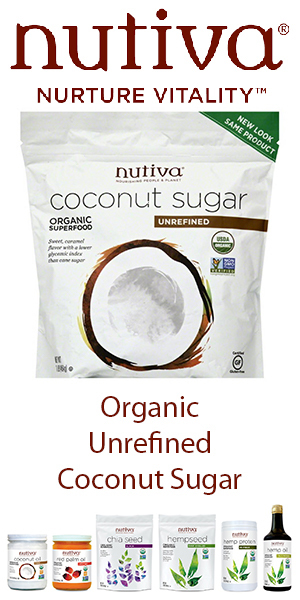 Its subtly sweet taste and dry consistency is more appropriate when incorporated into blended drinks, desserts and other recipes to increase sweetness without substantially intensifying sugar content. In our opinion, the powders are best used as compliments to other low glycemic sugars like yacon or stevia, which have a much sweeter taste. 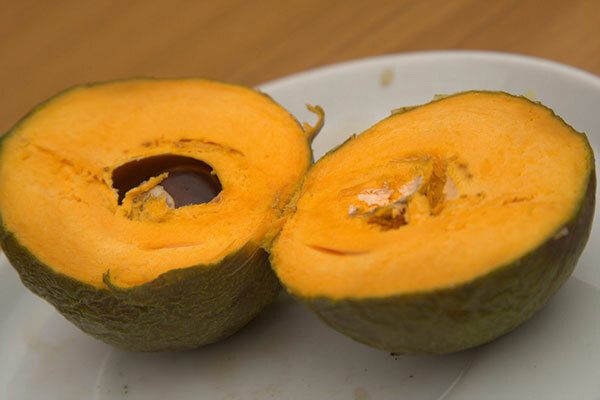 The texture of the fresh pulp is described to be dry like hard-boiled egg yolk, a quality of which is also somewhat evident in the ground fruit sugar. 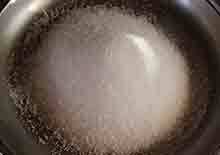 The powder is therefore not usually ideal for dissolving into hot teas and drinks. 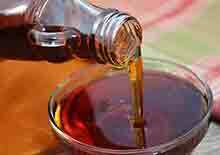 Unlike crystallized sugars or pourable syrups, it will most likely sink to the bottom of your tea cup and has a bit of an aftertaste when used in this manner. 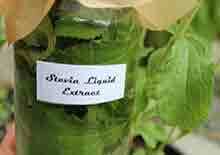 Simply created from the whole fruit pulp, rather than from saps or juiced extracts which undergo evaporation techniques to condense sugar molecules, it is more along the lines of a dried fruit powder rather than a concentrated sweetener like honey, coconut nectar or xylitol. Lúcuma (pronounced loo-ku-mah) comes from a genus Pouteria, a group of flowering trees in the family Sapotaceae. This genus is often referred to as "pouteria trees" which collectively also goes by the name "eggfruit." This title denotes their familiar starchy hard-boiled egg yolk-like texture. Lucuma, Pouteria lucuma (or formerly Lucuma obovata), is much like that of the canistel fruit (Pouteria campechiana), native to Mexico and Central America, as it has a similar texture that is also frequently incorporated into sweet desserts and drinks. 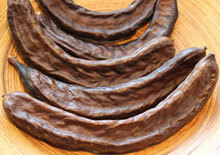 Other related species in the same genus include mamey, aibu, zapotillo and sapote. Also called lucmo, lucumo and lucma in different countries such as Peru, Ecuador and Chili, lucuma is an evergreen tree that ranges in height between 25 to 50 ft (7-15 m). Producing big white blossoms, it bears fruit all year long but is especially prolific January thru April in Peru. The rounded or irregular oval-shaped fruits have a thin green skin, similar to that of an avocado. They are likewise one of those fruit species that often requires post-harvest ripening after they fall from the tree or are hand collected. The pulp flesh usually surrounds one or two large glossy brown seeds that are comparable to durian seeds, although not quite as large. Lucuma trees grow in temperate desert-like climates as well as subtropical to tropical climate zones. Some propagation has been conducted successfully in other countries, such as New Zealand, using cultivars like the "la molina." According to the "The Lost Crops of the Incas", first published in 1989 by the National Research Council, lucuma was one of the trees integrated into the Inca's sophisticated form of agriculture on the high plains of the Peruvian Andes. (Source) The fruits were considered a staple Incan food source and grown along with other cultivated crops like quinoa, passion fruit, maca, cherimoya, yacon and golden berry. Lucuma trees are popular for their abundant fruit harvests, with some Peruvian varieties capable of producing close to 500 fruits a year from one single tree. The specific species Pouteria lucuma is native to the highlands of western Chile and Peru as well as southeastern Ecuador. Today it is extensively cultivated in these locations, with Peru providing most of the world's lucuma powder as an export product. The bulk of commercial production is processed into a dehydrated form with only a small percentage reaching local markets to be consumed fresh. As we mentioned, it is virtually impossible to find fresh lucuma in countries outside of its natural habitat due to the fact that it ripens quickly with cracking skin that is somewhat delicate to transport. It is occasionally sold as a frozen fruit pulp, but is currently (as of 2016) a hard to find freezer item in most health food stores and only available to a small degree from online suppliers. 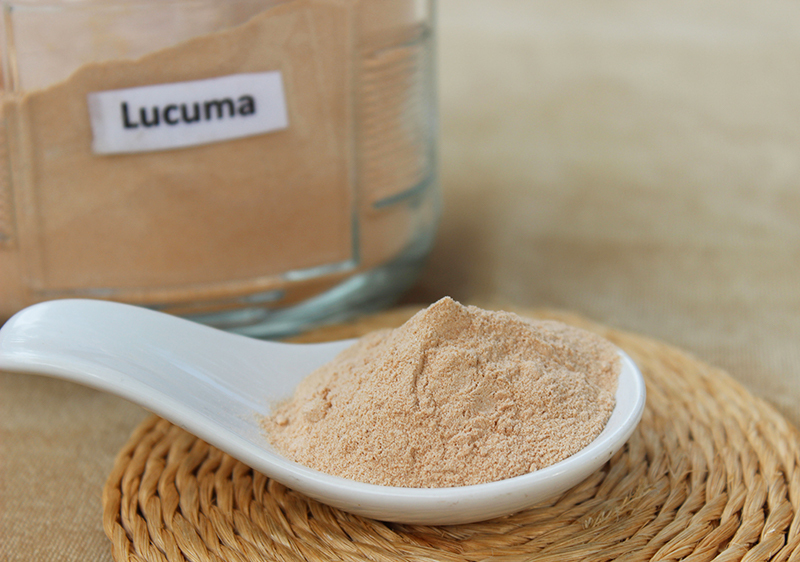 Lucuma fruit and its dried powder is considered a healthy alternative sweetener that provides a sweet taste to drinks and recipes, but without substantially increasing sugar content. 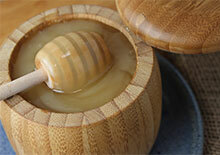 When you taste the powder directly, it is quite evident that the sweetness is very mild compared to other sugars. 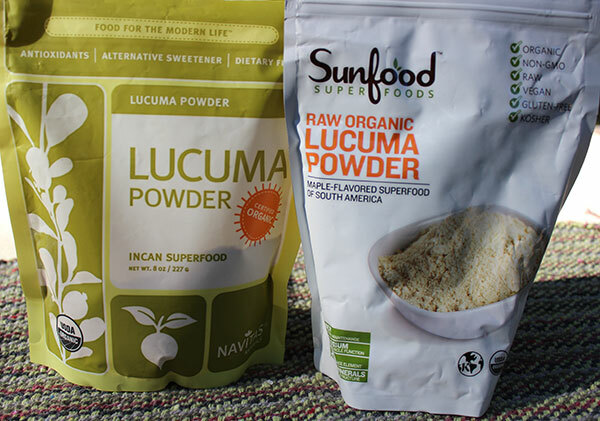 Although there is not much data on lucuma and its researched sugar ratios, there is a significant amount of information stating that dried lucuma powders are known to be a low glycemic food, usually referenced at about a 5 on the glycemic index (GI). This essentially means that the fruit sugars are slowly released into the bloodstream, rather than causing a sudden rise in blood glucose like refined sugars and foods with a higher GI. 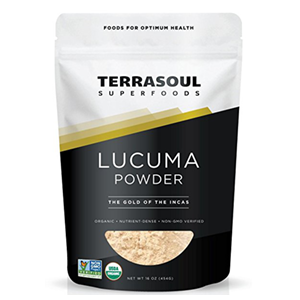 Being a whole fruit powder, lucuma contains a relatively high amount of fiber content, a known factor for lowering GI levels as the presence of soluble dietary fiber acts to slow the gastric emptying rate and sugar metabolism. Because of these characteristics, lucuma is often recommended as an alternative option for those with type 2 diabetes or for individuals with weight gain issues. However, again, be aware that to date there has not been much scientific investigation conducted on the health benefits of the Pouteria lucuma species and its direct effect on blood glucose. One study, analyzing the "antihyperglycemia and antihypertension potential" of lucuma as well as other Peruvian fruits, including Physalis peruviana or golden berry, it was shown that lucuma had the "highest alpha-glucosidase inhibitory activities." Alpha-glucosidase inhibitors work to reduce the impact of carbohydrates on blood sugar. In conclusion, Peruvian fruits in general were suggested as beneficial food-based strategies for those with diabetes or high blood pressure. Although most fruits contain very little starch content, lucuma, like plantain, is a starchy fruit variety. Starch molecules are storage polysaccharides or longer chains of simple sugars known as "complex carbohydrates." It is the most common carbohydrate in the human diet and is present in many staple plant-based foods, like potatoes, grains and even legumes. These long chain starches, when consumed as whole foods, are more slowly digested and utilized as a longer burning energy source. 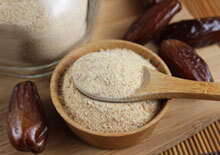 In our inquiries we have not come across an exact sugar profile of the lucuma fruit or its dried powders, but besides the starch element it does contain glucose, fructose and sucrose. In the book "The Ultimate Guide to Sugars and Sweeteners", it was found that, according to a number of source estimates, 1T contains 60 calories and 13 grams total carbohydrate (with 2 grams of various sugars and 11 grams starch). By comparison, the Sunfood Superfoods lucuma nutrition label states that 1T contains 60 calories, 5 grams of sugar and 14 grams total carbohydrate, which would seemingly include 9 grams of starch. Keep in mind that lucuma is also harvested at different stages of ripeness, so depending on the brand some can be higher or lower in sugar, which may affect the level of sweetness. 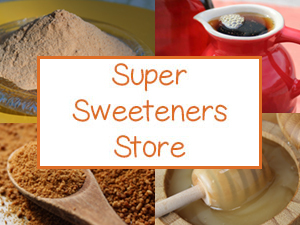 While your own selection of sweetener options may be relative to what you are typically used to consuming, lucuma as well as other low glycemic sugars, like yacon, stevia and monk fruit, can be used on their own or blended with other concentrated sugars to create the best results for your own particular needs. 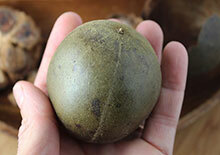 Although sometimes referred to as a "Peruvian superfruit", we would not necessarily classify it as such. While it does contain some nutritional value, it is more of a sugar alternative rather than an adaptogen or antioxidant-potent fruit variety. It is claimed to be particularly high in the antioxidant beta-carotene and B vitamins. The beta-carotene orange-yellow pigment, while evident in the ripe fruit, is however largely missing from most powders which are typically a lighter pale yellow color, indicating lower beta-carotene amounts. Nutritional product labels from higher quality organic lucuma sweeteners display 0-6% vitamin A content, depending on the brand and serving size. Other nutrients also referenced include vitamin C, folate, niacin and various minerals such as phosphorus, zinc, iron, manganese, magnesium and calcium. Moreover, as a low acidic fruit, the dried powders are much more alkaline in relationship to most sugar concentrates and natural sweeteners. While lucuma can be picked and consumed as a raw fruit in native habitats, it is not usually eaten straight because of its dry texture. The seeded pulp is typically integrated fresh as a sweet ingredient in recipes or is sometimes frozen for later use. In other countries it is almost chiefly imported as a dried powder. The flesh of the fruit can vary, but is usually between a pale to bright yellow-orange color. According to several sources we have come across the reason why the powders are typically a lighter pigment is because they are harvested when slightly immature. This is apparently better for processing into a type of flour, but may not necessarily provide the same qualities as the ripe fruit. The deeper the color of the dried powders and more fragrant the aroma of the powder, one would assume the riper the fruit was when harvested and processed. These selections, in our opinion, are more flavorful and potentially more nutritious. In addition, fruits grown in the Peruvian highlands, usually the Oxapampa region, are considered to be of superior flavor and traditionally prized over other varieties. When comparing the ripe fruit pulp to its dried variation, we have noticed that the pulp is significantly sweeter and has a stronger caramel-like flavor. To experiment, we dehydrated the fresh frozen brightly pigmented pulp and powdered it in a high speed blender to see if it was much different than the color, taste and texture of the commercial sweeteners commonly sold. 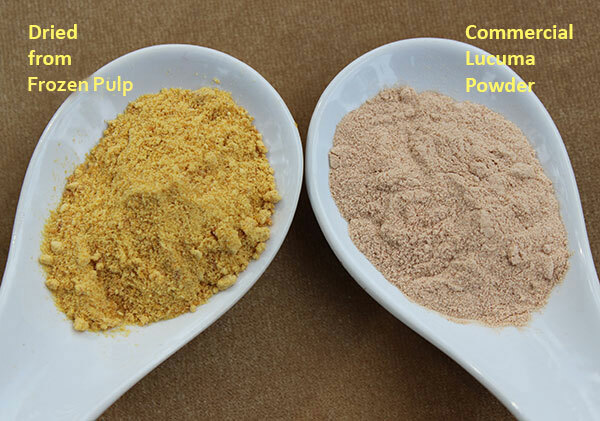 Results revealed that when dried and blender milled, it was a much lighter color with more yellow pigmentation than compared to the fruit pulp it was created from. 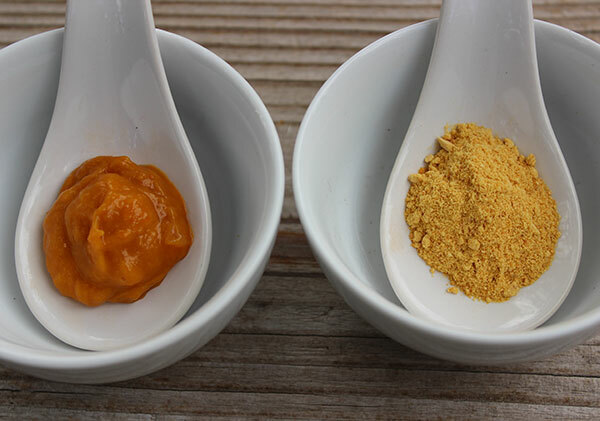 However, it had a much brighter yellow-orange color in contrast to commercial lucuma powders, but with only a slightly stronger flavor. Both dried varieties had a similar starchy texture. 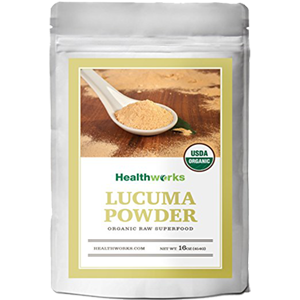 Is Lucuma a Raw Sweetener? 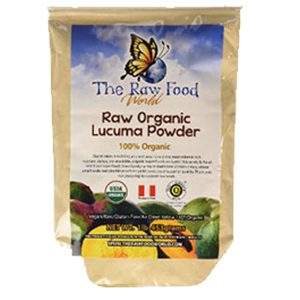 Not all commercially available lucuma is considered "raw" or is processed below 118° F (48°C). Some are dried and milled using a process that employs or exposes the fruit to high temperatures when dehydrating or grinding, while others are low-temperature dried. When the product is labeled "raw" this is usually the case, however keep in mind there are no legal standards for what qualifies a food as "raw." It really depends on the brand and the integrity of the company you are purchasing from. Although there are others, these are the ones we have personally tried and enjoy. 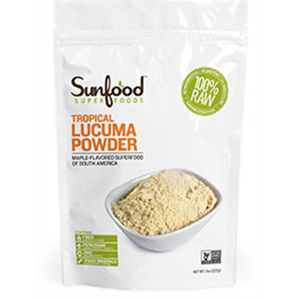 Lucuma powder is convenient to use in recipes in substitution for other sugar types, especially when you don't want a super sweet taste. 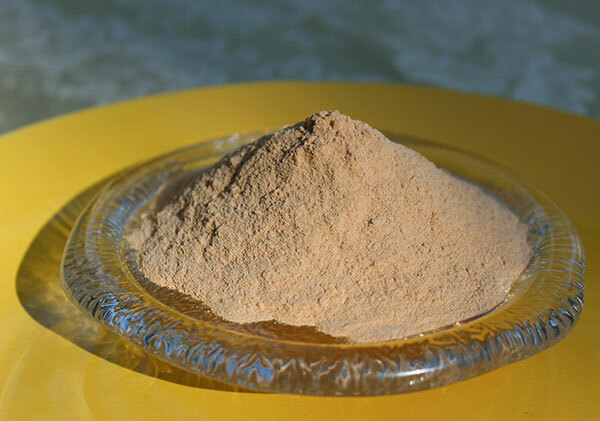 Although versatile for use in many recipes, the dried fruit powder has a similar consistency to flour and can add a creaminess to certain foods. 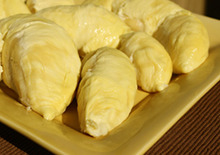 For this reason, it is particularly favored in desserts, like puddings, custards, mousse and ice creams. 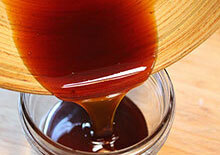 It can also be used in preserves and pie fillings to create a thick texture and added fruity sweetness. 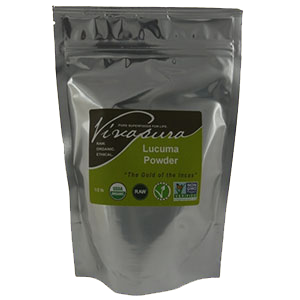 The powders also blend well with the textures of fats, nuts, and seeds. As a result, they are delicious in shakes, using nut milks, almond milk or coconut kefir. Blended with carob powder, which is a similar consistency, it can be used as a chocolate or cacao alternative in many bars or desserts. We use it in our chia seed porridge recipe as well as our carrot cake, coconut cream pie and superfood ice cream. 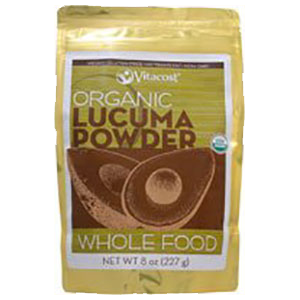 Lucuma is a relatively safe sweetener to consume in moderate amounts. It is best to seek the advice of your healthcare provider or dietitian when using it as your primary sweetener, if you are diabetic, have obesity issues or candida overgrowth.